Can 你 believe that in the future Hermionie and Ron are gonna get married? I can't. There has to be something wrong with her eyesight! Oh, I didn't realize marriage should be based solely on how physically attractive their partner is. 你 know, Hermione isn't drop-dead-gorgeous either. At least, not in the books. She has big, bushy hair and (for the first three and a half books) buck teeth. Ron isn't horrible looking. He's fairly normal looking, actually. The reason they are together is because their personalities match perfectly. They have liked each other since 年 one at Hogwarts, and their feelings have slowly grown to true love. They fit perfectly together personality-wise. Believe it 或者 not, looks aren't everything. That pic is so precious. 爱情 the pic! And I agree with lucius_malloy! There's nothing wrong with her eye sight!!!!!! Anyway, she loves him for who he is, not what he looks like. How could a relationship built on something as shallow as appearances ever last? It's definitely not the kind of relationship I would want. though im a H/Hr shipper too but i like Ron and Hermione together cuz they are well suited for each other and even each other out...in some ways i find that harry and hermione are too similar in many ways. Hermione isn't shallow enough to fall for someone JUST because they're good looking. Ron is funny, brave, talented. It doesn't matter to her what he looks like, and it shouldn't. 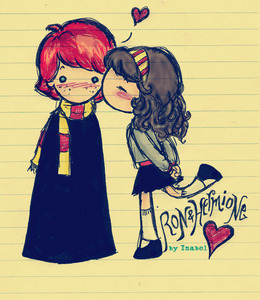 I 爱情 Romione and I've explained why time and time again. I'm not going to this time. 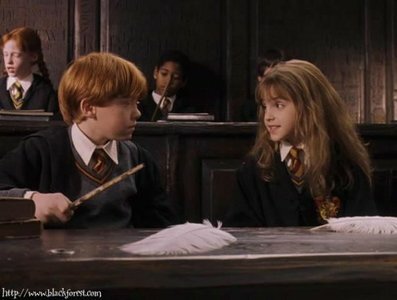 Ron and Hermione are together get over it. okay, for one thing, her eyesight is just fine since Ron is very goodlooking and another thing if Ron wasn't good looking it wouldn't matter because 爱情 doesn't have to be based on looks like in Twilight 或者 in The Mediator 或者 in 迪士尼 电影院 或者 whatever, 爱情 is based on how much the couple has in common, how they feel about each other, and other good things. Also Ron and Hermione have been 老友记 forever and Ron's protected her many times, even saved her life, and she him! So get over it! i dont she married him for his looks! 你 are an imbesle! At the end of Deathly Hallows there's a part that's labeled 19 Years Later. And Ron and Hermione are married, and Ginny and Harry are married. I totally believe that. It's dumb to judge someone 由 their looks. What about personality? That's a big part of it. Looks help, personality is key. i'm all with 你 on that one. It just ruins the whole movie. she's better marrying harry he's smarter and 更多 good looking than ron. If you're just watching the 电影院 then yes but otherwise there are zero evidence that Harry is better-looking 或者 smarter than Ron in the books. What kind of 问题 is this? I don't think theres anything wrong with her eyesight. 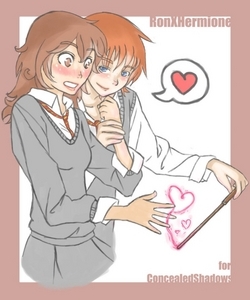 Hermione likes Ron for who he is. But anyway, marrige has nothing to do with looks.. but of course, somebody does want a pretty 或者 handsome mate! ha ha. Who agrees?